I really like Frontier Airlines. Not because I have ever been on one of their jets, but because they came to SBN and thus Delta had to compete with them on fares. 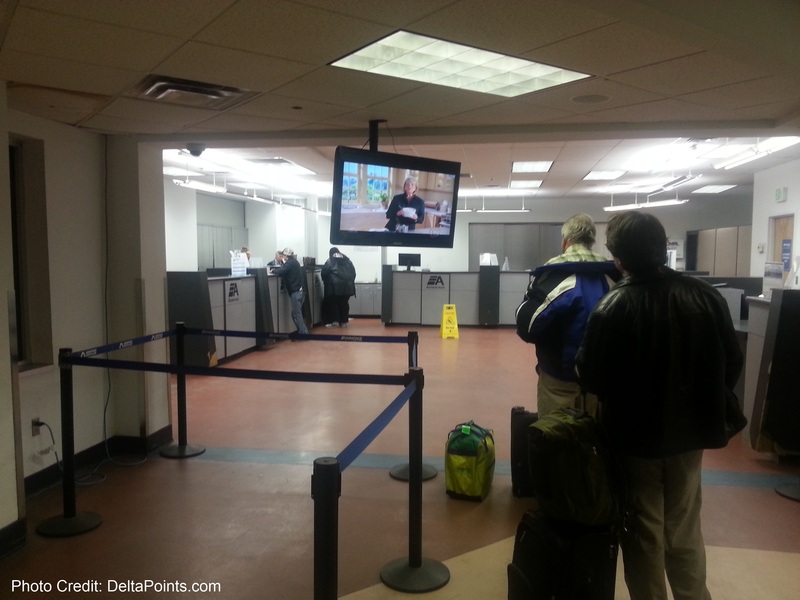 I was able to find a great redemption from my buy-one-get-one-free companion certificate that is a benefit of the Delta Reserve AMEX card so Lisa & I both flew out to Denver for under $200 all-in. I earned both MQM’s and RDM’s (2x RDM’s since I am Platinum Medallion) and Lisa earned nothing on the free ticket. First some tech stuff about the trip. 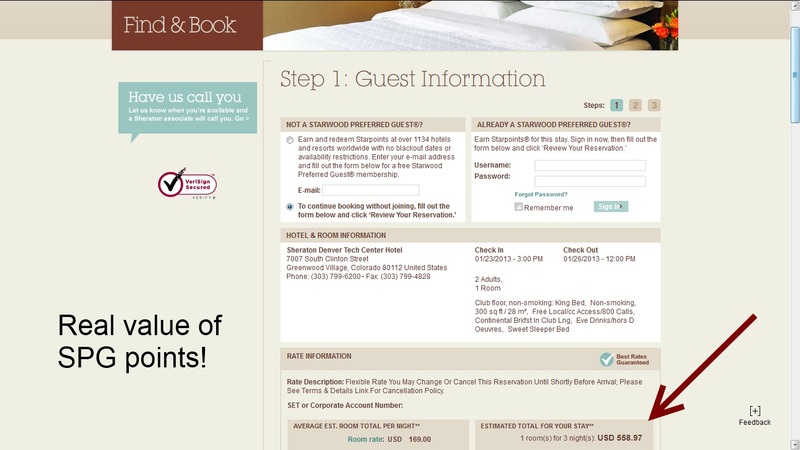 As you can see, since I always use online check-in, I was prompted to offer up my seat. All the flights were full but not over so no joy there. The next bit is that these certs have the restriction that you may not ever get an upgrade. If you are GM+ you can pick EC (economy comfort) seats but that is it. 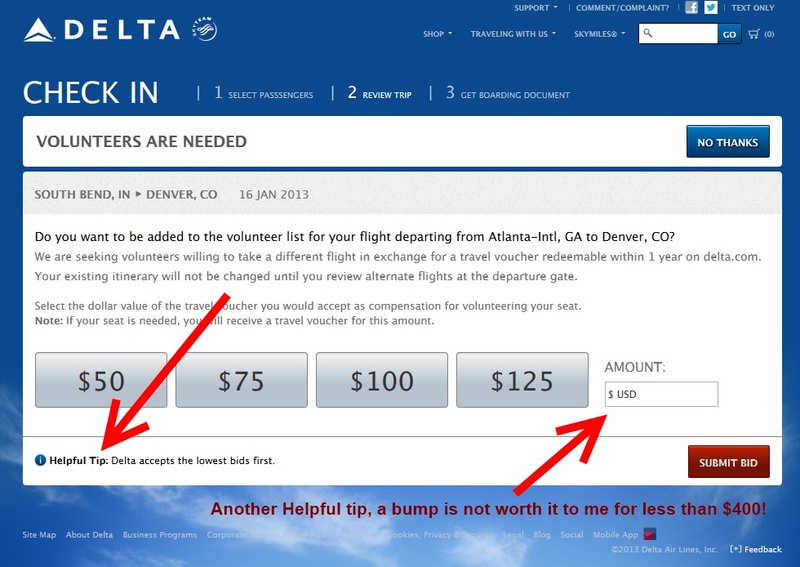 The web site still allows you at check-in to request a medallion upgrade, but it does not work. In the past you could split the PNR and get the paid seat upgraded and the free one not. Also, in the past, you could get agents in the Skyclub or at the gate to override the lockout for the upgrade list and you would then have a chance at an upgrade. 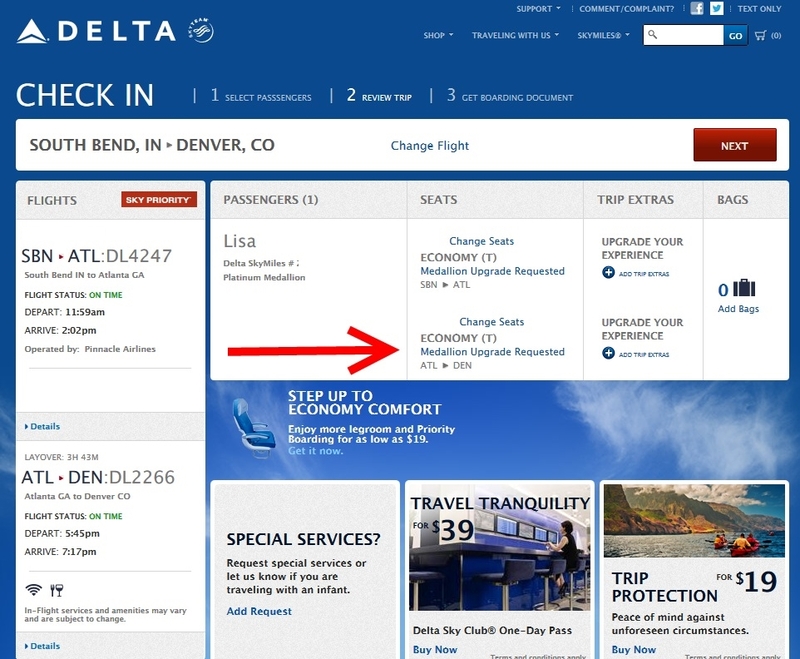 I can tell you all the old ways are done and Delta’s “outstanding” IT department has successfully locked down all these workarounds (now maybe they will have time for the award calendar bugs – nahhh). 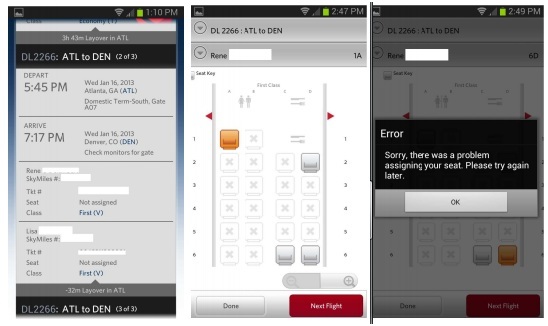 The phone app is also a bit confused as it seems to let you choose a medallion upgrade on the certs and tells you that you can pick a first class seat, but then when you try it you get an error and it will not lock your seat in. 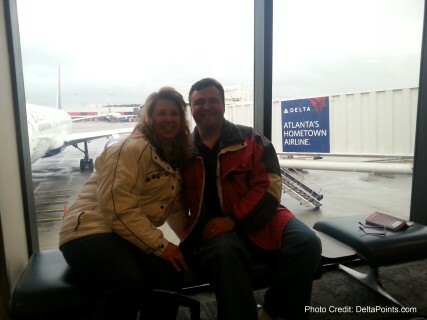 So we were off and on our way from ATL after visits to the xpress spa, Chili’s and Skyclub in the A concourse. I love booking enough time between flights to enjoy the travel day so it become part of the vacation rather than stress! Our 757-200 had the configuration where we could select the 2 seat EC exit row (seat Guru as this as avoid but they are wrong). 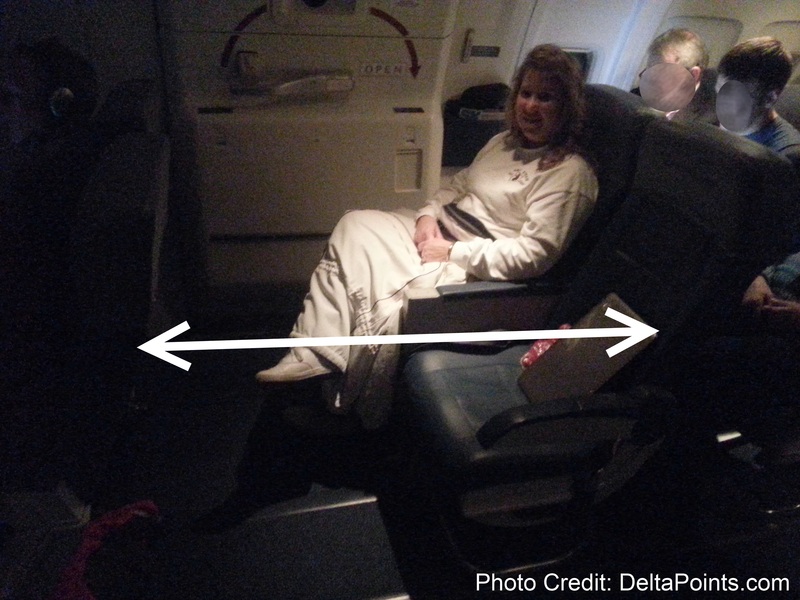 These seats have as much leg room as BE (business elite) seats on an internationally configured bird. I could not reach the seat in front of me with my leg stretched out. Just perfect! Once we arrived, we went out the doors to the shuttle bus to Advantage car rental. I was a bit worried after having read about this company’s ratings, and walking into the rental office it did feel a bit “low rent” but I was very pleasantly surprised by the rental. Sure the rep pushed the fact that my auto insurance did not cover things like tires and paint, but I am a big boy and can say NO to extras. Plus I paid with my Chase Sapphire Preferred® Card for additional auto protection. There was a line but my wait was no more that 10 min. They did not have the tiny 2 door car I had requested (they warned me that is what I had requested – I said as long as it runs it is fine) and I was put in a 4 door Toyota Corolla. They want you to do the inspection and I marked all the places on the car that had issues very carefully. Drop off was quick and easy and I rented the car for 3 days for $37 ALL IN! WOW (Tip: code DC31133 gets you 10% off)! My gas was more than that. I will be trying these guys again! 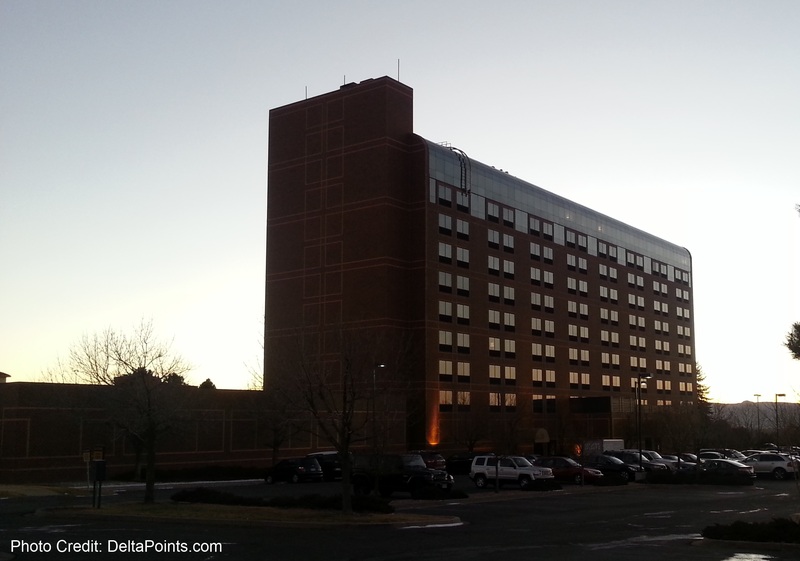 On to the SPG Sheraton Denver Tech Center hotel. Overall it was a great stay, but there were some issues. I booked the room on SPG points, 14,000 for the 3 days for a club level room. When you look at what 3 days would have cost on the club level you can see the value. 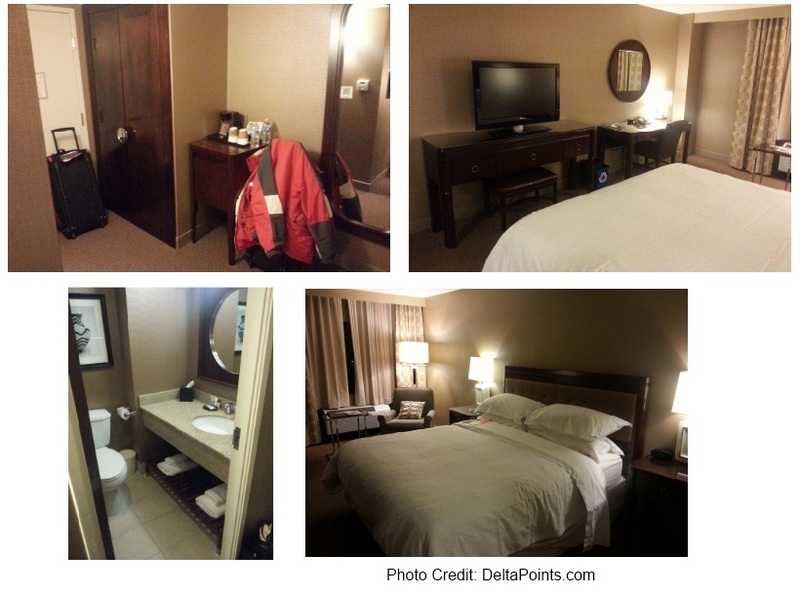 At check-in I was not recognized as a GOLD Starwood preferred guest and had to ASK for my GOLD bonus (a drink or 250 SPG points – I went with the SPG points). I also was hoping for a chance to upgrade to one of their Atrium rooms on the top floor (one of the main reasons I picked this place over the Aloft at the airport for 1/2 as many SPG points) but they were all full. I was put in a king room on the 9th floor. The room was fine and the A/C worked and the bed was soft and nice. I have no real room issues other than the fact that the bathroom was just about the smallest one I have ever been in. I mean I have been in airplane bathrooms bigger that this (I kid but not by much)! The wifi was free but restricted to 1.5mbs and worked fine but made running my home PC via Logmein a bit hard and frustrating. If GOLD SPG’s get the same free wifi as everyone else what is the point of it as a perk? 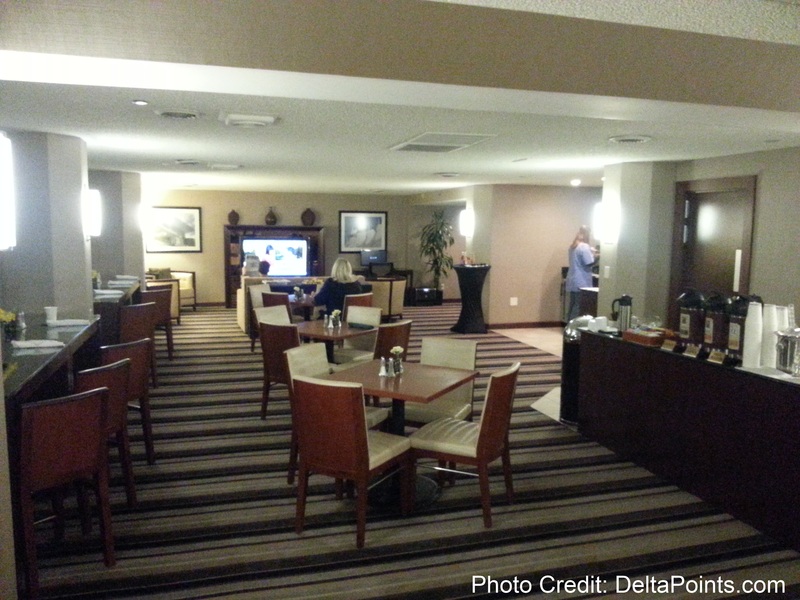 The other reason I love Sheraton hotels is their lounge on the club level. This one did NOT disappoint. It was great. Breakfast each day was very nice. Both the morning and evening staff were cheerful and kind and seemed so happy to see us. Love that! 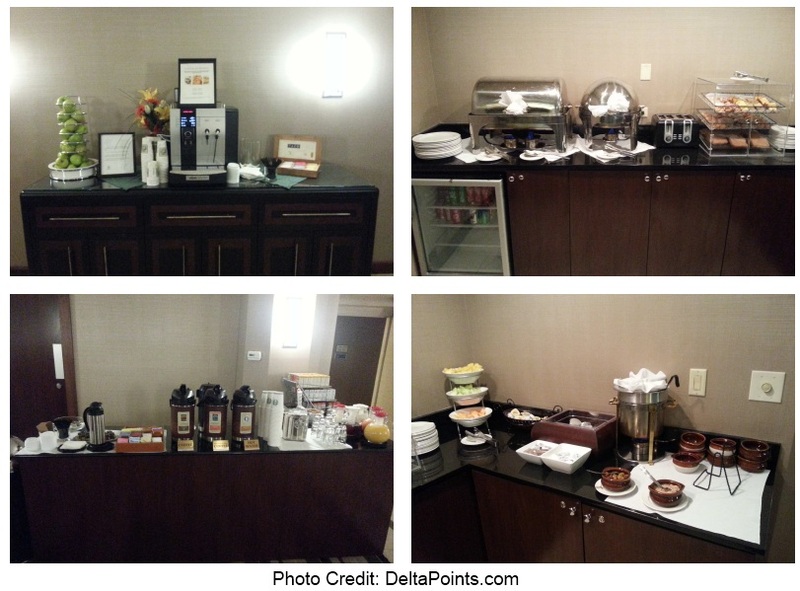 There were lots of hot and cold choices and it was much more than a basic continental breakfast each day. At night, the snacks were a mini-meal and they offered free wine and beer! This is great value to me as we had big lunches each day and after a full day of skiing just wanted a little bite before bed. So off to the ski resorts. The drive all the way from Denver was under 2 hrs each day and even though long was spectacular and truly a fun drive through the mountains (if you enjoy that sort of thing). One scary scene on day two as we passed a truck going the other way enveloped in a cloud of smoke from breaks overheating on the way down the 6% grade. Our first day was at Vail. The place is nice, the runs are wide, everything is uber-expensive. 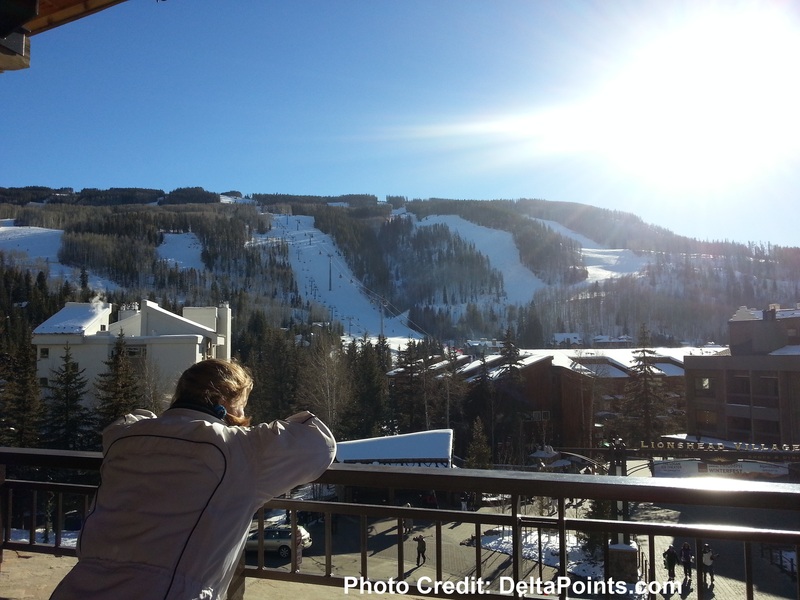 I had never been to Vail and was happy I went there and did enjoy the skiing but will not go back. The next day was Breckenridge. It was big, the prices were a bit less than Vail, it was a Friday so crowds were bigger. Again I was happy I went and the skiing was nice until late in the day when it got very icy and but again I will not go back. 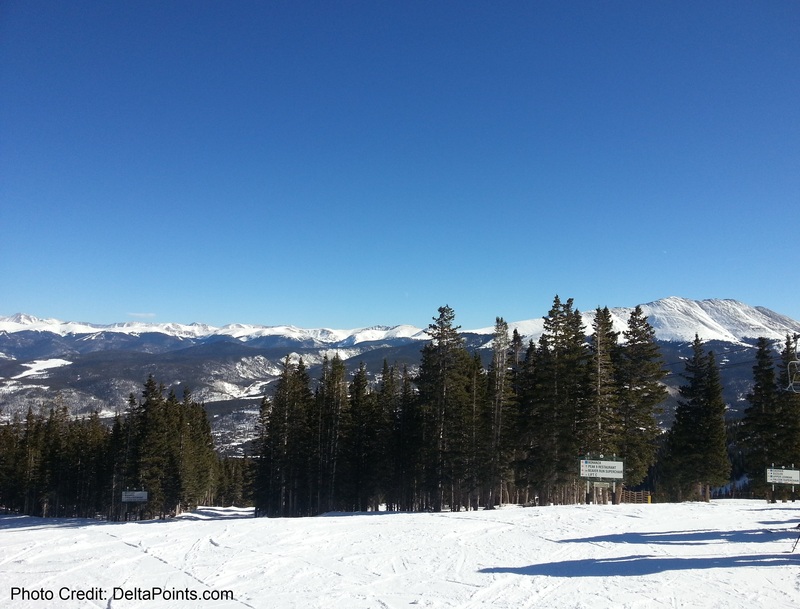 Please don’t let this short summary of Denver skiing put you off on a visit. You can get a discount on lift tickets to many spots if you buy more than a week before your trip online. For me, having been skiing Salt Lake for years, that is the best snow on earth HANDS DOWN. The prices are MUCH better; the snow is better. The traffic moves better; the restaurants are better. They have the quick start program that gives you a FREE pass the day you fly in! To me, Salt Lake is just better and I will be going there next month and every year I can! ← New Priority Club PointBreaks lists should be out soon (this week?)! I agree that on an average day that Salt Lake has much better skiing at a more reasonable price. However, a fresh powder day on the back bowls of Vail is truly an experience. Where did you find the car rental rate. Did you go through Advantage directly or through some portal first? I’m looking at Denver rates for late March and can’t find anything like that. @MSPTraveler – direct at the site. I booked about 1 month ago. For some reason, Hilton quit giving us our requested snacks we are supposed to receive as diamond level members. So I switched to the extra points and we don’t seem to be having a problem getting those. I wonder if that is just a systematic decision hoping to save money because I was made to feel like a jerk for asking at some properties. Jealous you are skiing! 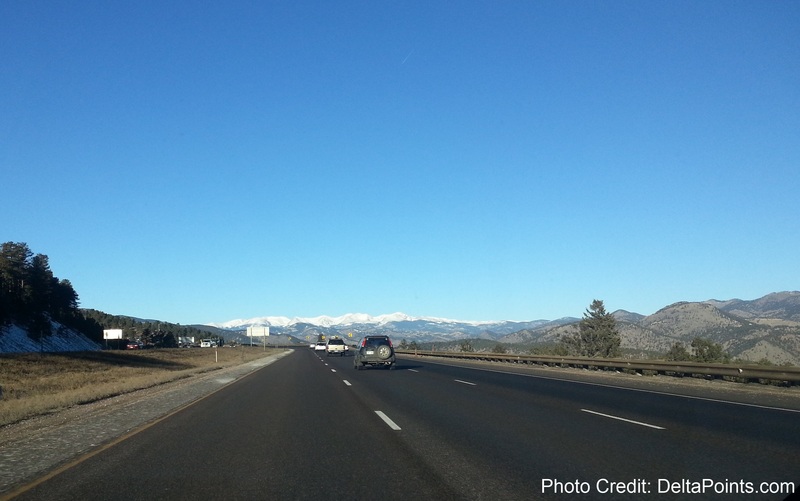 I usually get two to three ski trips out West a year…and so far I’ve had ZERO this season. I hope you are enjoying it, Rene, because I’m JEALOUS! Maybe throw Frontier a fare every so often so they stick around SBN for awhile… I lived there for awhile and liked it, but fares weren’t great especially after losing American.